Partnerships, marriage, and social relationships take top priority, and if there’s turmoil brewing, it can escalate significantly. Taking a stand may be important, but you may also need to seek positive solutions for peaceful settlement of disputes — at work and at home. Frustrating physical conditions may seem more irritating, or it could just be that your patience has run out. Knowing how far to go—whether it’s an exercise routine or treatment choice — can be difficult. Releasing anger is one key to feeling better. Sometimes you simply can’t win. Or at least that can be how you feel near the time of the solar eclipse on August 11. Explosive emotional outbursts are not necessarily your style, but you do need to vent. (Primal therapy, perhaps?) Ifyou’re the brunt of another’s anger, that can be the straw that breaks the camel’s back. It’s time to explore intimate needs and deep commitments, and to release old hurts during the Moon on August 26. You can’t heal ifyou’re hanging on to pain. 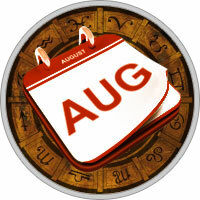 Even though Mercuiy ends its retrograde cycle on August 5, you may still run into problems with employees, coworkers, or contracts. Competitive circumstances are high focus from August 1 to 14, and your great ideas can be thwarted simply because you’re trying to bring innovative change. Fit them into a reasonable budget and get backing. Unrealistic situations are exposed to realistic examination, and if you can stand the heat of criticism and trim your sails for the time being, you’ll make progress.